O’Connor holds the inscribed copy of The Brothers Karamazov his students presented him at the end of his final seminar in Stokes 205S, on May 4. “Frazer literally read himself blind, gang, isn’t that fantastic?” said Mark O’Connor, leaning over the seminar table, resting his weight on the tips of his fingers. It was late April, in Stokes 205S, two weeks before O’Connor completed his 43rd and final year of teaching at Boston College, and his 37th consecutive year of teaching “Western Cultural Tradition V–VIII,” a required two-semester seminar for sophomores in the four-year Arts and Sciences Honors Program. O’Connor’s course focuses on European cultural movements from the Renaissance to existentialism, and on some three-dozen assigned readings in literature, philosophy, theology, and psychology, in addition to dozens of paintings and musical compositions examined in class. It runs from The Prince (1532) and Shakespeare’s Richard II (1595) through To the Lighthouse (1927). On that day, the seminar’s 14 students were considering Frazer’s account of the cult of Attis, god of vegetation in Phrygia (now Turkey) circa 900 B.C. The son of a virgin mother (“Wowza, ring any bells?” chimed O’Connor, who has a penchant for antique exhortations), Attis bled to death under a tree (“crucifix, anyone?”), and was honored in a springtime festival (“hmm, Easter?”), at which priests, “stirred by wild, barbaric music,” as Frazer writes, castrated themselves. I sat in on the two-hour seminar on Tuesdays and Thursdays from early March to May 4, when he taught his last class. Because most sections of the honors seminar for freshmen begin with The Odyssey, O’Connor concludes the sophomore class with Virginia Woolf’s “odyssey of a woman trying to make art and life meet, which is one of the aims of the seminar,” he says. The sophomore seminar, one of three courses that he’s been teaching since joining the Arts and Sciences Honors Program in 1977, surveys the “complexity and scope of Western intellectual accomplishment,” following, among other threads, the relationship between the individual and society, scientific inquiry, the beautiful, and the sublime. The morning seminar, during a discussion of Manet’s White Lilacs in a Crystal Vase. “There’s an old Roman proverb: Always leave the table while you’re still hungry,” O’Connor told me one day this spring, sitting in his tidy office in Stokes. He whispered for dramatic effect: “I’m still very hungry.” He wants to spend more time with his six grandchildren, however, and help take care of his 95-year-old father-in-law, and travel with his wife, Mary, a retired school teacher—”My much better half, my Mary, my Marysia,” is how he refers to her in class. 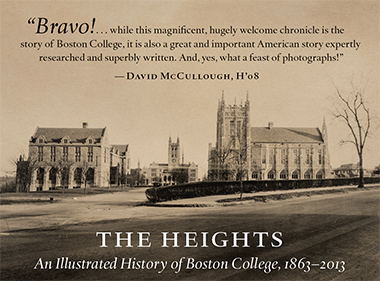 One of Boston College’s core curriculum options, the honors seminars start out as 12-credit, year-long courses. The freshman course begins with the Greeks, goes through the Hebrew Bible, and ends with Dante and Chaucer; the sophomore course ranges through Milton and Cervantes, Kant and Rousseau, and into the early 20th century. The junior seminar (six credits, one year) covers modernism and postmodernism. Seniors may write a thesis or take a seminar that revisits a text from earlier in the program. The South Shore native studied history at Holy Cross and earned his Ph.D. in Slavic studies from Boston College in 1978, writing his thesis on “Cultures in Conflict; A Case Study in Russian–Polish Relations: The University at Wilno.” He had been a lecturer in survey courses such as “Cultural and Intellectual History of Modern Europe from 1500 to 1789” and “The European Experience” when he received an invitation to teach a section of the sophomore honors seminar, then called “Modern Man,” in 1977. O’Connor addresses Gywneth Miner during the afternoon seminar on April 4. John Howard, SJ ’59, MA’62, a longtime professor in the Honors Program, gave him some advice. “The most important books you’ll encounter are your students,” O’Connor remembers Howard telling him. “Each of them is just as involved, complicated, and multi-toned as anything Dostoyevsky wrote.” From then on, O’Connor would return to his office after each class and write notes on his students’ insights and questions, and then work them into the next seminar. “I learned to become six times over-prepared. Good students ask tough questions, and you don’t want to constantly be professing your ignorance,” he said. After spending a year in Poland on a research grant, he joined the Honors Program full-time in 1981. He found himself learning more about teaching in the seminar than he did in a lecture course, “where you’re in complete control.” He prefers the seminar’s “intellectual ping-pong and unpredictability.” Still, he often lectured to start a class, to “calibrate” discussion. I watched him introduce The Brothers Karamazov with 15 minutes of Dostoyevsky’s biography, an etymology of the four brothers’ names, the novel’s roots in Scripture, and the historical context of the Revolutions of 1848 (“the revolutions that,” O’Connor said, pausing, and the class responded, “don’t revolve,” a familiar O’Connor phrasing). From left: Liam Formisano, Thomas Toghramadjian, Matthew Eckstein, and Martin Gilgenast. Please compare and contrast Candide and Rasselas as ‘philosophical tales,’ then try empirically to come to terms with what constitutes the Age of the Enlightenment by searching for common intellectual presuppositions uniting Voltaire and Johnson. In dealing with this larger problem, Kant’s essay ‘What is Enlightenment?’ should be used as a point of reference. David’s brooding Brutus done later in the same decade as Kant’s essay may, perhaps, provoke some darker-still brooding. Here’s the premise for your consideration: that Conrad’s Heart of Darkness is what the Germans call a ‘Kulturträger,’ that is, a culture-bearing work. Indeed we might want to term it a ‘golden bough’ that can bring us back, if we can bear the journey, to a bare, unadorned vision of our past. Or we might instead want to see in this heart the darkness produced by fecundity, a ‘tangled blank’ of a bough weighed down by all we have read, seen, experienced. How might we now return to where we ‘began,’ ‘and know the place for the first time’? How might we understand earlier writings, paintings, and music we’ve explored in the ‘light’ Conrad’s novella sheds on what we’ve seen? “Montaigne composed his life by writing books. I’ve tried to compose my life by teaching the books that show how to compose a life,” O’Connor said. On May 4, his last day as a teacher, during his morning seminar, O’Connor displayed on the screen a still-life bouquet of white lilacs in a crystal vase. “Manet painted this as he died,” O’Connor began. When Manet was dying of syphilis, his sister-in-law visited him each morning with flowers, which he painted. The lilacs in the painting reflect sunlight, and appear to be moving. “I find beauty here, I find life here,” said O’Connor. “Manet is making art out of nature, nature out of life. This is a great last testament worth striving for.” Normally, O’Connor sat facing the class and with his back to the painting he was elucidating. Now he stood looking at the painting, silent. From left: Ciara Bauwens, Kiran Khosla, and Simi Siddalingaiah, during the final morning seminar. As O’Connor packed his book, laptop, and collection of notes from previous years’ seminars in his backpack, Emily Zhao ’19 stood up and said, “Professor O’Connor, thank you for teaching us that salvation is collective.” Then she presented him with a hardcover edition of The Brothers Karamazov, with 14 inscriptions. An hour later, O’Connor began his afternoon seminar, and his two final hours of teaching. In celebration of his tenure, the Honors Program had invited faculty and many of O’Connor’s former students. Some 50 attended in the cavernous Murray Room. Sean Flahaven ’95, a producer of Broadway musical albums (including the Grammy award-winning Hamilton), and Sam Sawyer, SJ ’00, an editor at the Jesuit magazine America, had taken a train from New York City. Andrew Skaras ’15 had flown from Dallas, and reread To the Lighthouse on the flight. Four students from the morning seminar had come back for round two. For the first 45 minutes, O’Connor and his current students, seated before him in a tight semi-circle at the front of the room, discussed a painting. Then O’Connor invited everyone in the room to join the seminar, to gather in a large circle. Moments before class ended, Emiley Zalesky Lockhart challenged one of O’Connor’s long-held interpretations. Where O’Connor sees “profoundly abiding romance” in Mrs. Ramsay finally leaving the room where she’d been knitting and meditating to join her husband for a walk outside, Lockhart saw “submission,” a sacrifice of freedom in aid of keeping a frail marriage from shattering.